In a context of intense competition in the marketplaces it seemed appropriate to offer everyone an automatic competitive watch tool, also called automated competitive watch, automatic tariff alignment, automatic pricing benchmarking etc, we just call in the module Repricing as it is generally named thus in English. The Amazon module v4.1 includes therefore natively and free of charge a Repricing automaton. Here you can indicate your Amazon AWS keys, a tutorial will explain you how to get these keys. A “Connectivity Test” button allows you to check that the connection between your website and Amazon functions properly. The module will automatically subscribe you to two services, one for sending the price feed from Amazon, the other to a message queue (price) that will store them temporarily. You can create one strategy per repricing profile, which may correspond to a repricing strategy by category. You indicate your selling price limit, for example +30% of your purchase price and the latitude that the automaton will have to negotiate downwards or upwards. This index will indicate the price revision algorithm, a progressive rate of aggressivity, the higher is the aggressivity,the lower is the price. 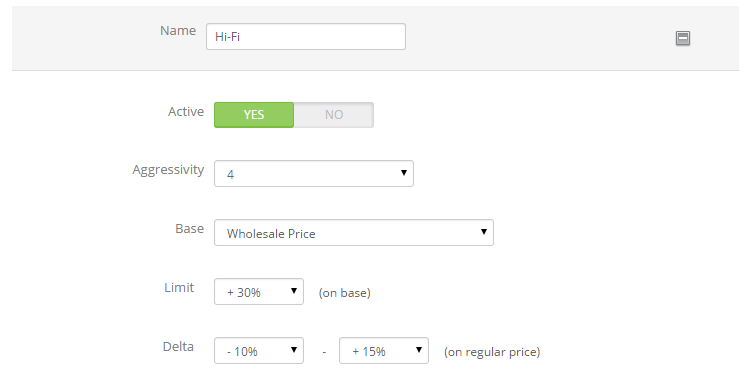 According to the base price you will indicate a percentage below or above which the module will not lower the price. Percentage upwards and downwards. It is simply the negotiating latitude left to the module. You specify a percentage of how much the automaton can lower or raise the price, the automaton will not go below the “Limit”. The module will automatically install (via Prestashop Cronjobs) new scheduled tasks, that we will call “repricing automaton”. The automaton will collect the price change notifications from Amazon, analyze the notification, then determines whether the product is eligible for repricing, if the product has a repricing strategy and applies the appropriate strategy. Depending on competing offers the module will reposition your offer; downwards if a more competitive competitor has been found or conversely, upwards, if all your competitors have exhausted the product and you are the only one to sell it, then you balance your margins. Collections can outnumber shipments to Amazon because it is not possible to send a large number of requests to Amazon, quotas are to be respected. This is why the automaton after having collected several repricing actions, will export all updated prices in one batch. Skip this step if you are not technical! First part, the automaton subscribes to an Amazon MWS notification feed that will contain price change notifications on offers, a collection of corresponding offers, and send them to a message queue in the cloud. This service is free and is provided by Amazon MWS. Second part, the subscription to the Message Queue is necessary since the sending of the notification requires it, the automaton therefore subscribes to a SQS Message Queue service provided via Amazon AWS. Subscription to both services is automated. The automaton will also use this queue as intermediate area to store the collection of updated offers to send to Amazon MWS. The collection and analysis automaton generates an outbound feed of messages encoded in JSON, the stocks in the outbound Message Queue. The Export automaton will read these messages, send them to Amazon MWS then delete them. This functioning allows to make the actions of repricing unique, if a price is changed several times, the automaton considers only the latter. Common Services does not receive any charge, fee, commission, nor affiliation, and also has absolutely no income from this service. Simply, we limit the support to configuration malfunction, we cannot train about the concept of repricing, the user will have to be documented on the subject. However, it is necessary to subscribe to an Amazon SQS queue to run this service, the queue is free up to 1 million messages per month, but you can very quickly reach those volumes; a notification is a message, if other automatons like this one change a price at each notification, there is a safe bet that the volumes will quickly become substantial. During the development phase, it was observed that for an average customer in a competitive market with 10,000 offers online from Amazon, the system generated about 40,000 messages per day. We will not give commercial information on AWS, you have to make for yourself a simulation of the cost, manage your consumption of messages. 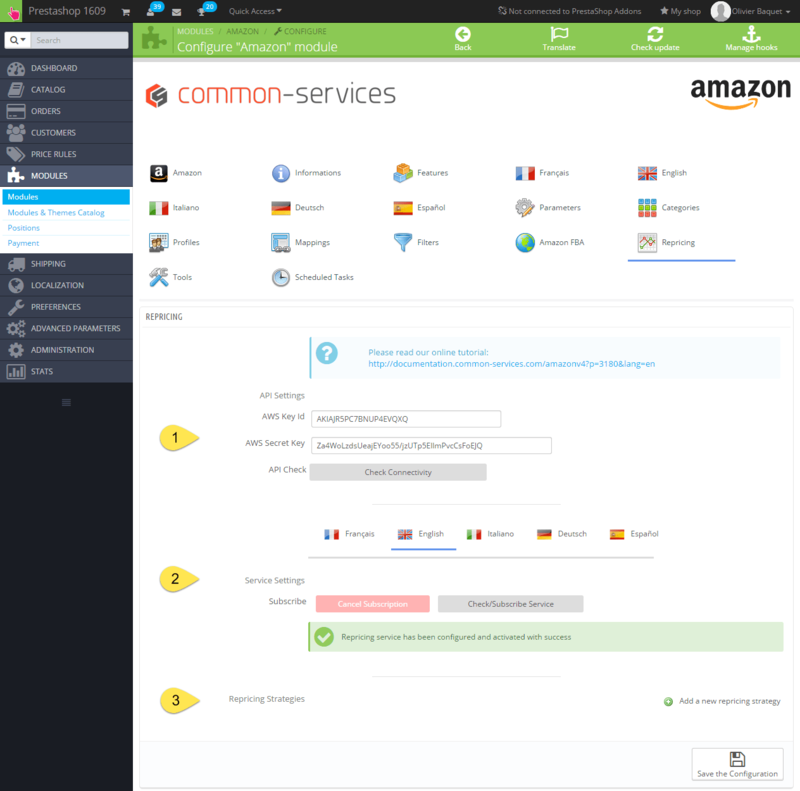 However the cost of this service is marginal in comparison with the service provided, and even for such a volume of messages, it will take a subscription of few euros a month to the Amazon AWS service. Only the Amazon AWS account creation is not automated, but you have access to an account creation tutorial directly in the repricing tab of the module, this account creation is simple and is done in few steps. Commissioning is automatic, once your Amazon AWS account created and the keys indicated in the module, the module automatically subscribes to the necessary services.